Despite having used larger models in its ad campaign, the range on the H&M website appears to stock zero items in a size XL or 16 and above. Its cropped leather biker jacket and cropped top only goes up to a size medium, while its ankle-length leather trousers, leather dress and patterned swimsuit doesn't go beyond a size 14. A sold out printed T-shirt featuring Donald and Daffy Duck goes up to a large, while a pink faux fur coat, which is also listed as sold out, only shows available sizes ranging from an extra small to a medium. No items in the Moschino collaboration range are listed as being available in a size extra large or beyond a size 14. "There were some items within the collection that went up to an L for both ladies and men," H&M told HuffPost in a statement. They added that many items are "currently sold out online and in store which may account for not being able to see the full size range of a particular item online, as it might be showing as sold out". 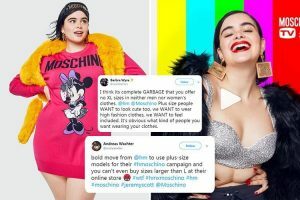 It seems a bizarre move not to cater for plus-size women seeing as the man behind Moschino, creative director Jeremy Scott, featured plus-size model Barbie Ferreira in a lookbook for the range prior to its launch. It implied the collection would cater for women her size, however H&M confirmed that the Moschino TV H&M collaboration was not offered in plus sizes for ladies or men’s. It said in an email to HuffPost: "H&M is constantly evaluating our collaborations in order to improve product offering for our customers and recognises that this is an opportunity for the future." Many customers took to social media to bemoan the lack of inclusivity. One tweeted: "Bold move from @hm to use plus-size models for their #hmoschino campaign and you can't even buy sizes larger than L at their online store." Another wrote: "I think its complete GARBAGE that you offer no XL sizes in neither men nor women’s clothes. @hm @Moschino Plus size people WANT to look cute too, we WANT to wear high fashion clothes, we WANT to feel included. It’s obvious what kind of people you want wearing your clothes." Yesterday we told how Poundland poked fun at the H&M X Moschino collaboration with its cut-price dupes.